Mindfulness, the practice of directing your awareness to the present, is the latest buzzword in the wellness community — and for good reason. Not only can you use mindfulness to boost empathy, sleep better, and reduce your stress levels, you can also use it to better your relationship with food. That’s right — mindful eating is a real practice, one that can help shape your body as much as it shapes your eating philosophies. Read on to learn how to harness the power of mindfulness to choose healthier foods, lose weight, and actually enjoy the process of eating — no guilt or self-judgment necessary. Mindful eating, which is sometimes called intuitive eating, is the practice of being present as you eat, says Krista Haynes, R.D. and Beachbody Nutrition Manager. It’s about giving your full attention and focus to noticing the way your food tastes, smells, looks, and how it makes you feel. “By itself, mindful eating is not a weight-loss cure, but as part of an approach or tool it can catapult healthy eating and weight loss,” says Klapow. That’s because being conscious of what you’re putting in your body is key to choosing healthier, more nourishing foods. Haynes says mindful eating shifts the focus from calories and numbers to how certain foods make you feel. “You begin to understand how food is energy and nourishment versus a passive event void of pleasure,” she adds. 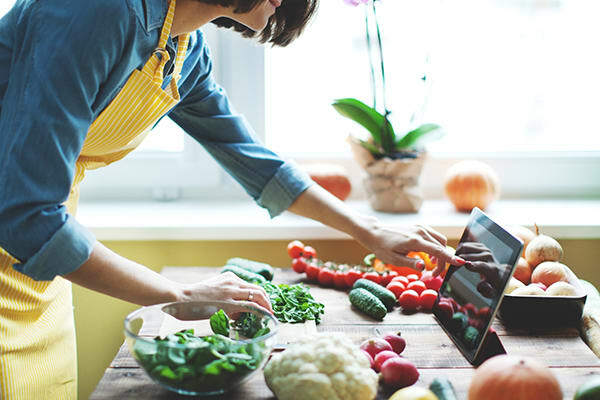 Mindful eating helps you eliminate these distractions so you can become more in tune with your body, says Paige Bente, M.S., R.D. and Beachbody Nutrition Manager. “This can help you establish a healthy relationship with food, lose weight, and avoid the deprivation-binge cycle,” she says. A big component of mindful eating is the quest to understand why you’re eating. Before you reach for the chips and salsa or dive into your lunch at 10 a.m., take a moment to notice how your body feels. Is your stomach gurgling? Do you feel lightheaded or tired? Are you thirsty? Consider your environment as well. Are you bored? Do you feel the urge to procrastinate on work? “Because so much of eating happens without awareness, the pause itself allows us to make eating [more] purposeful,” says Klapow. Before you roll your eyes at this one, consider the fact that there are times when you inadvertently slurp, scarf, or completely inhale your food, either out of extreme hunger or bad habit. Not only can this hinder proper digestion (and potentially scare your dinner guests), it also means you miss out on the complex textures and flavors of your food, Haynes says. When you chew well, on the other hand, you register each salty, sour, or sweet flavor as it hits your mouth, which helps you savor your food more thoroughly. “[Chewing] allows you to get more out of each bite while also slowing down the eating process,” says Klapow. Resist the urge to wolf down your food; instead, focus on eating one small bite at a time and chewing it completely before you swallow it. Preliminary research has shown that drinking water before a meal may prevent you from overeating (not to mention help you stay hydrated), but the simple ritual also has the power to shake you out of autopilot mode and bring you into the present. “It can prevent the automatic eating cycle by slowing down your mind prior to eating, allowing for concentration and focus on the process of eating to come,” says Klapow. Whenever possible, choose colorful, fresh, unprocessed foods for your meals and snacks in the proper portions. Since mindful eating teaches you to notice the subtle flavors in foods by slowing down and taking small bites, you’ll develop a better taste and appreciation for naturally healthy, whole foods. “This could ultimately entice you to choose carrots with a natural sweetness over a sugary treat, or whip up some vegetables because you love the flavor instead of drowning them in dressing or cheese,” says Haynes. Close your laptop, switch off the TV, and step away from your desk. Mindful eating is about focusing solely on the food in front of you, not your emails, a magazine, or the latest episode of New Girl. 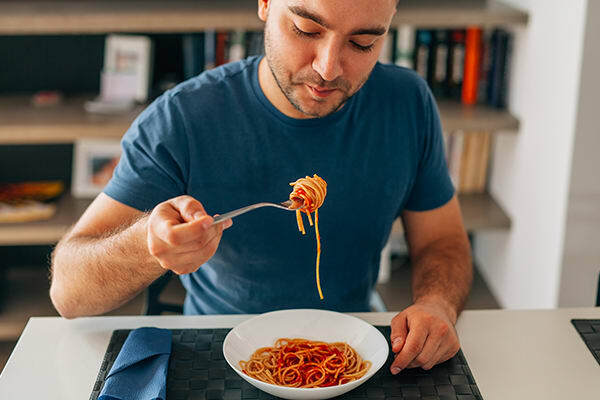 Even listening to music or podcasts can be too distracting — research shows that the noise your food makes when you eat can significantly influence how much food you consume. This “Crunch Effect” suggests you’re likely to eat less if you’re aware of the sounds you make as you eat. When you drown out that noise with earphones, though, you can end up consuming more. In the same vein, it’s challenging to eat mindfully — to savor your food and notice your body’s satiety signals — if your attention is scattered. The research agrees: Eating while distracted can lead to overeating, while attentive eating can help you lose weight. It takes your brain about 20 minutes to receive the signal from your gut that you’re full. It’s easy to overeat in that small window of time, which is why it’s a good idea to take a break before loading up your plate for round two. This waiting period gives you time to process the food you’ve eaten, Klapow says, and allows you to make a conscious choice about whether or not to get a second helping, rather than heading back to the kitchen out of habit. According to Klapow, “urges to eat are often [just] urges for oral sensation fulfillment.” In other words, oftentimes you aren’t actually hungry, you’re just craving the ritual of indulging in something. When this is the case, make yourself a cup of tea. Try black or green tea for a boost of caffeine, peppermint or unsweetened hibiscus for a strong flavor, or rooibos tea with fresh lemon, ginger, and apple cider. The process of boiling the water, steeping the tea, and sipping it usually cancels out the snacking urge, Klapow says. If you’re practicing mindful eating for the first time, Bente recommends using a journal to record how you’re feeling, identify your cravings, and make note of when and where you’re eating. Recognizing your cravings when they happen, Klapow says, allows you to make a conscious decision whether to indulge or not. Not just that, but taking note of your eating habits and environment can help you figure out what you need to adjust to eat more mindfully. If you always eat lunch in front of your computer, for example, then wind up feeling uncomfortably stuffed, you can try trading your screen time for 20 minutes of eating in peaceful silence. When you’re trying to lose weight, it’s easy to become so concerned with what and how much you eat that you forget to actually enjoy your food. Of course, it’s important to understand the nutritional value of the things you’re putting in your body, but if you’re overly preoccupied with counting calories, you’re likely to experience a lot of self-imposed guilt and judgment. Instead of approaching meals with dread or fear that you might overeat, approach them with a sense of joy and excitement. Savor each delicious, healthy bite and revel in the process of nourishing yourself and taking care of your body. When you’re kind to yourself and take genuine pleasure in eating, Bente says you’re more likely to honor your body and eat only to the point of fullness.